Ready for a full service betting experience? Step on up to BetOnline.com, one of the most legendary online gambling portals, operating for over 20 years. 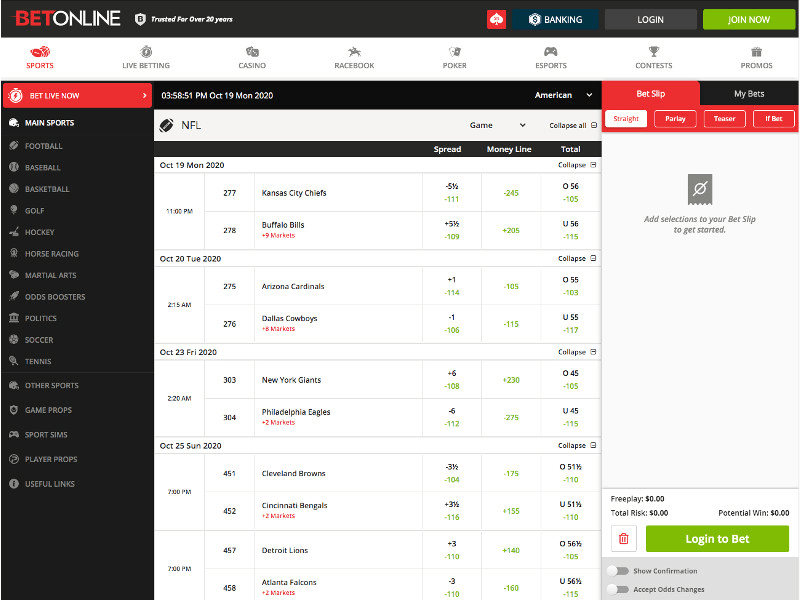 In recent years, BetOnline.com has re-focused its efforts on providing a great customer experience. With emphasis on account security and customer service, BetOnline has hundreds of thousands of happy members. You can get an extra 50 percent added onto your sports betting bankroll on your first-ever deposit at BetOnline.ag. Simply use promo code NEW2500 while making your initial deposit and your 50 per cent bonus will be added onto your balance within seconds. To maximize your earnings, you can score up to $2,500 worth of free plays from this one deposit. 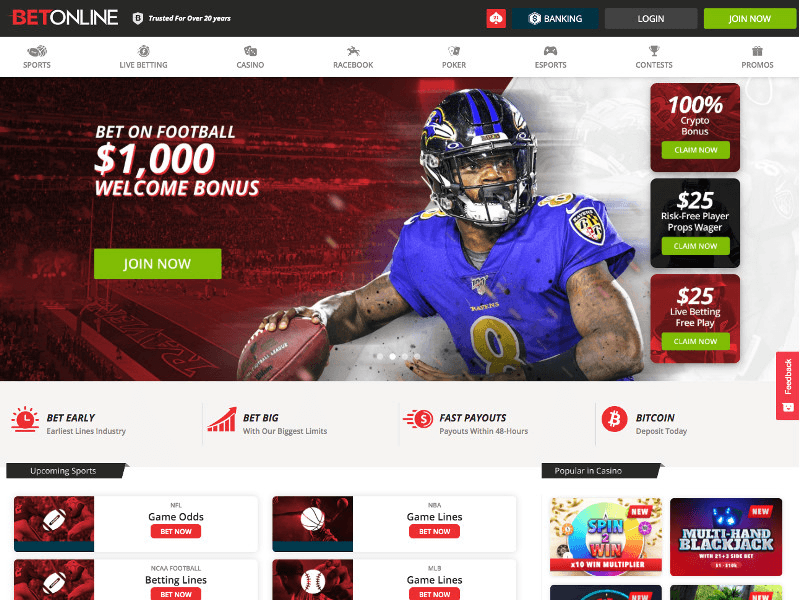 Based in Costa Rica, BetOnline is close to the U.S. and bases its business model around Americans, catering their wagering lines to favor action from U.S. players. BetOnline also observes all U.S. laws per state in determining the age it will accept a player as a client. All new BetOnline customers making their first deposit of $50 or more receive a 50 percent bonus of up to $2,500. However, you can choose the Lifetime Bonus Guarantee and receive 25 percent up to $1,000 every time you make a deposit of $50 or more for the lifetime of your account. Choosing the latter comes with a 6x rollover requirement, and means that you cannot withdraw any funds until 30 days have passed since claiming each bonus. In addition to the awesome lifetime bonus guarantee, and other bonuses shown above, BetOnline has several ongoing promotions that are dripping with value. Refer a friend to BetOnline and receive a $100 free play when they meet the requirements. There’s no limit to the number of friends you refer, so you could really stack up some Benjamins. Be sure to check the website during major sporting events because BetOnline has a reputation for creating some fantastic promotions involving these occasions. One of the advantages of using an established betting site like BetOnline is the sheer number of banking options available to you. Deposits can be made via Visa, MasterCard, money orders, Bitcoin, Skrill, Neteller, Diners Club, check, wire transfer, bank transfer and a whole host more. Getting your hands on your funds is just as easy thanks to there being at least 10 options available, such as Bitcoin, Skrill, Neteller, bank wire transfer, check by mail, courier, or epxress. Some of these carry charges, which vary on the amount being transferred, so please check before you withdraw. As with most online sports betting sites offering their services to American customers, North American sports feature heavily in BetOnline’s betting market offering. The usual big hitters are all present and correct, such as baseball, football, basketball and hockey, with odds also offered on soccer, tennis, boxing, cricket, martial arts, softball, and sometimes the likes of motor racing, darts, golf, rugby and snooker during major tournaments. All odds are competitive with BetOnline’s rivals, and with that offer of a lifetime bonus, you could do well to make every bet at BetOnline. They also offer a wide variety of prop and future bets on almost every sport and virtually every game. Yes, BetOnline offers wagering via the mobile device of your choosing, and they are so sold on the quality of this app that they want you to give it a try at no risk to your wallet. For those trying the mobile betting (phone or tablet) for the first time, just place a bet of up to $50. If it wins, that's great. If not, then email support and up to $50 will be reimbursed within 48 hours. To claim your free seat, just make your first-ever deposit at BetOnline.ag and you will then be awarded with an entry ticket to Sunday’s tournament at 8pm (ET). You name the sport - football, baseball, soccer, hockey, basketball, tennis - and it's a sure bet that BetOnline offers live wagering on it. 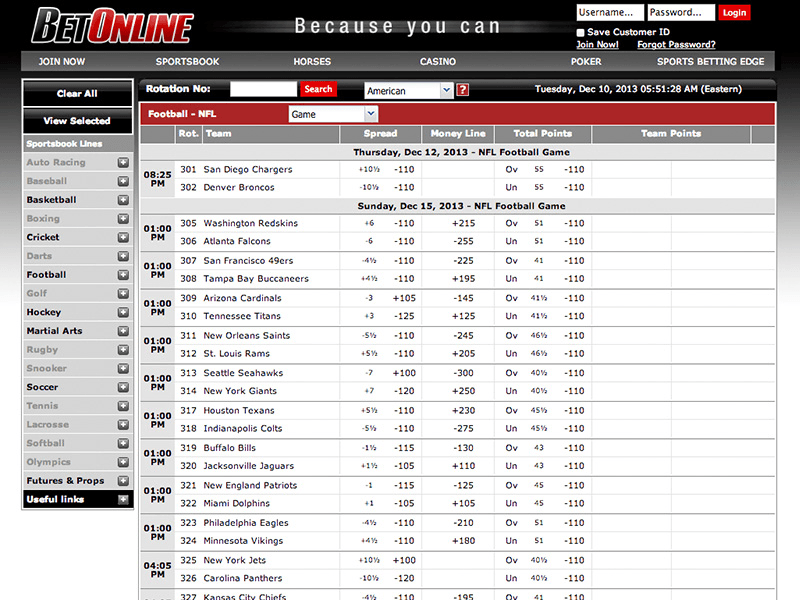 You name the league - MLB, NFL, NBA, NHL, even WNBA - and BetOnline offers liver wagering on it. When you come to try the live betting software, you receive a free $25 risk free bet. Place a $25 bet with your own money. If it wins you win, if it loses, email customer support with the details of your bet and they will put $25 of free play into your account. BetOnline's customer service team is available 24 hours a day, seven days a week. You can contact them via their toll free phone number, a via a variety of email options that are divided into four categories - general enquiries, skill games, casino games and poker. Love playing casino games? Then you’ll love the BetOnline casino, as it allows you access to your favorite games from the comfort of your favorite chair at home. All the usual games - blackjack, roulette, Caribbean Stud Poker, Three Card Poker, Keno, and Craps - are there in multi-colored glory, complimented by a host of slots and even a live casino where actual dealers deal the games. A number of casino promotions are ongoing, including a Monthly High Roller Bonus (you must wager more than $75,000 in a month), a 25 per cent reload bonus on every deposit you make, a 100 per cent matched slots bonus on every deposit of $100 or more, a risk-free $25 bet for trying the Live Dealers for the first time, and a 10 per cent rebate program on your casino play if you lose $100 or more in a week. If you are new to the BetOnline casino, there's a seat with your name on it at the $5,000 new player freeroll game. 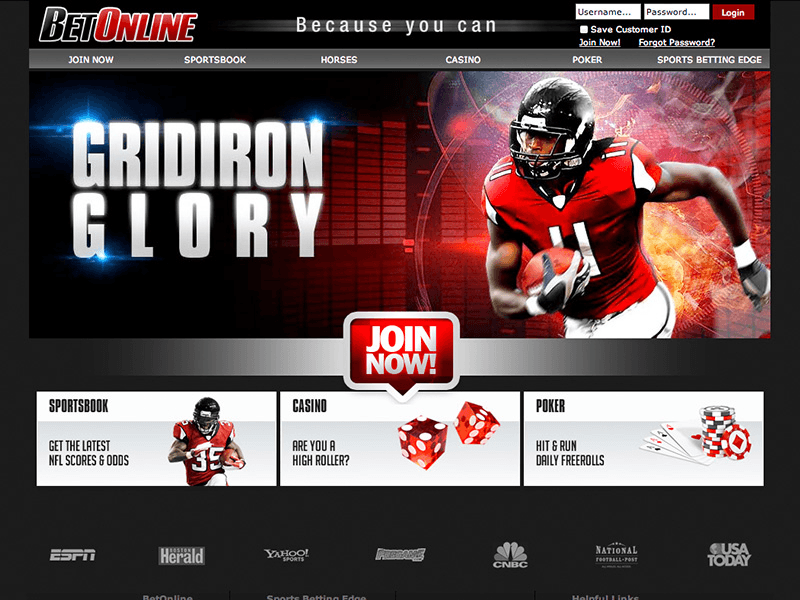 Simply make a deposit and reserve your spot in the game, held every Sunday at 8 p.m. EST. BetOnline has an online poker room on the Chico Poker Network, which allows players from the USA to play the country's favorite card game online. It's the third-largest poker network for Americans, with over 2,100 players. A significant software upgrade in 2016 turned BetOnline's poker room into one of the most impressive on the internet. Every Sunday there is a $99 buy-on tournament (you can win your way into it for a fraction of the cost) with a $50,000 guaranteed prize pool, ongoing cash races with unlimited prizes, and tournaments with more than $90,000 of guaranteed prize pools over the course of a weekend. What’s more, you can claim a 100 per cent (up to a maximum of $2,500) first deposit bonus when you initially sign up to the BetOnline poker room. What more could you wish for? BetOnline also offers a racebook, and your first $25 bet on the racebook is refunded if it loses, plus you can claim up to seven percent daily rebate on all of your racebook activity. Close Visit BetOnline and see for yourself... Bet now!